Bitcoin private price surged higher recently and settled above $50.00 against the US Dollar. BTCP/USD remains supported on the downside for more gains. 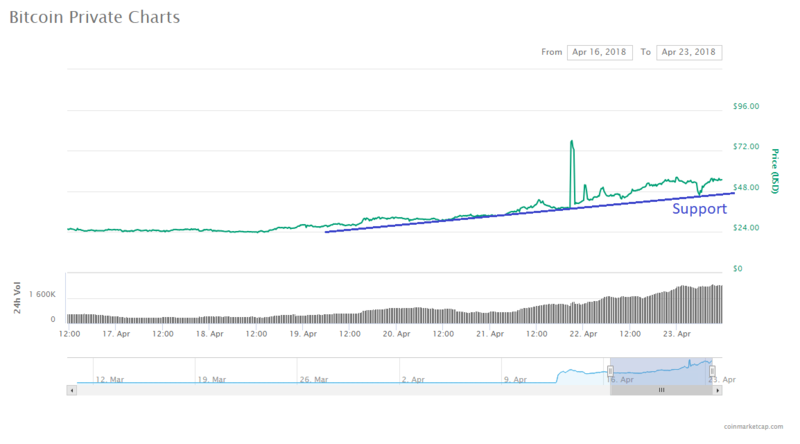 Bitcoin private coin price started a nice upside move and traded above $70.00 (Data feed of coinmarketcap) against the US Dollar. There is a major bullish trend line in place with support at $48.00 on the 7-day chart of the BTCP/USD pair. The pair is currently in an uptrend and it could break $65.00 once again in the near term. There were heavy movements in bitcoin private coin price from the $25.00 low against the US dollar. The BTCP/USD pair started a solid upside move and traded by more than 150% higher to clear the $50.00 resistance level. It even traded above the $70.00 level recently and formed a high at $77.15. Later, it started a downside correction and traded below the $60.00 level. There was also a push below the 23.6% Fib retracement level of the last wave from the $28.46 low to $77.15 high. However, the decline was protected by the $48.00-50.00 support area. Moreover, the 50% Fib retracement level of the last wave from the $28.46 low to $77.15 high also acted as a support. The price formed a base around the $48.00 level and is currently trading 20% higher to $55.00. On the downside, there is a major bullish trend line in place with support at $48.00 on the 7-day chart of the BTCP/USD pair. Therefore, bitcoin private price remains supported on the downside near the $50.00 and $48.00 levels. As long as the price is above the $48.00 support, it could continue to move higher. On the upside, an initial resistance is near the $60.00 level. A successful close above the stated $60.00 resistance may perhaps open the doors for a push above $65.00 or even $70.00. Overall, the current price action is very positive for BTCP and its price remains in an uptrend above $48.00.